This mudroom ideas post is sponsored by Hayneedle. All opinions are my own. We just moved to a newly remodeled 1950s home in Boston. One of the best parts about our new home is that we have a dedicated entry room that can function as a mudroom. I’m so excited about this space because it keeps all the dirt and clutter in one, organized space. 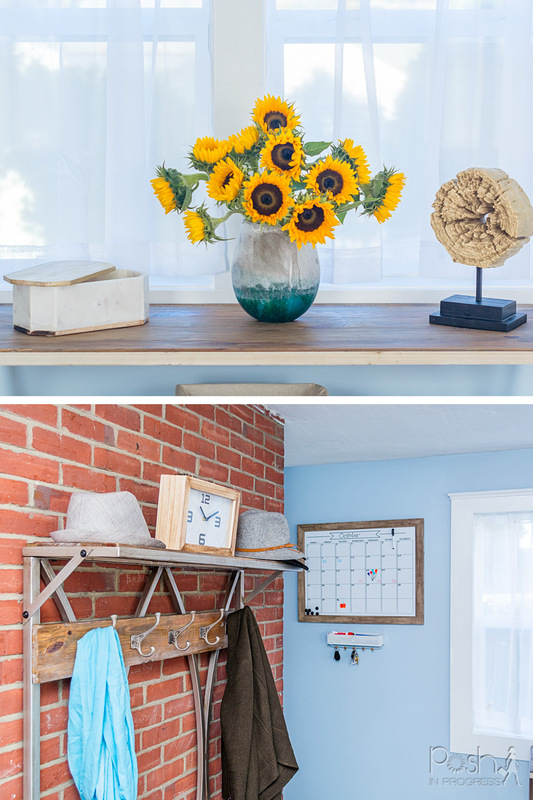 I teamed up with Hayneedle to decorate the space and now I’m sharing my mudroom ideas so you can create a functional and well-decorated space. Although we have lived in single family homes for the last several years, we never had a mudroom before. In Phoenix, we didn’t need one. It was rarely rainy or muddy. But in Boston, a mudroom is a must. I’m already picturing my kids running inside with slush all over their boots, their snowsuits dripping wet after hours spent building snowmen in the front yard. If you have an entry space or a room that could function like a mudroom, here are my 10 mudroom ideas to create the perfect and functional space. Also, be sure to check out this post, which is all about mudroom organization tips – and you can shop my entire mudroom here. Before you design any space, you need to decide on a general color palette. There are several ways you can go about this, but I’d start by thinking about the color of the walls that are already in the space. Our room is a light, almost robin egg blue. There is a natural red brick wall and the trim around the windows and baseboards is bright white. Right off the bat, I knew I didn’t want to do too much color because the blue walls and red brick already offer quite a bit of color. I decided on grey because I knew it wouldn’t compete with the other colors in the space and I knew I could find some accent pieces to bring some additional complementary colors into the space. I also made my decision after looking at all of the different hall trees on Hayneedle’s website. There were two I was deciding between – one that was mid-century modern and one that was industrial (the one I chose). Although I absolutely love the mid-century one too, I opted for the industrial one because I knew the reclaimed wood in a grey wash would go so well with the brick, and I was right. Nearly all of my other choices I built based on the hall tree. By choosing one focal item and building the room around it, I always had something to come back to if my design was going off-course. Kids have a lot of stuff – stuff that doesn’t always store very neatly. That’s where storage baskets come in. I opted to get several square baskets that could fit into the cubbies and on the open shelves of the console table. I use these open baskets to store hats, mittens, and umbrellas. Also, I got this large gray basket I’m going to use this basket to store their snow pants, larger scarves and other outdoor wear in-between wears. I seriously love the design of this basket and it’s also super functional. If you have space, your mudroom should have at least once bench people can sit on to put shoes on. I opted to get multi-use benches that also function as storage. This cubby bench has three spots that I can store outdoor accessories – like hats, gloves, and umbrellas. I also got a second bench that has a lot of spots of shoes. 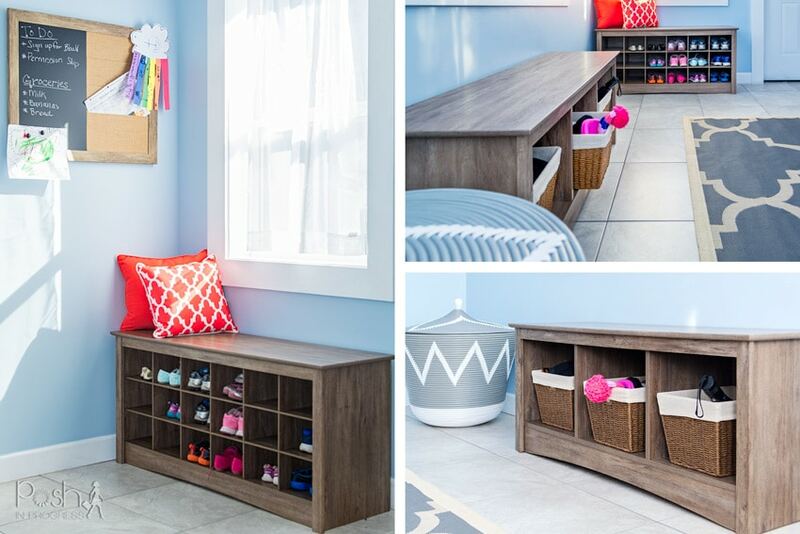 This cubby bench with shoe storage is ideal to organize kids’ shoes. I quickly realized that my kids had a lot of shoes, so having the extra storage is great. Plus, this cubby bench already instilled habit and routine in my kids. Right when they walk in the door, they sit on the bench, remove their shoes and put them in the open cubbies. I placed the two benches right near the door, so they don’t have to walk far before they remove their shoes, keeping dirt near the entrance. One of my absolute favorite parts of this mudroom is the hall tree. It is completely functional, but the design is modern meets industrial. I love the distressed wood against the curved metal. I also love this hall tree because it has an extra shelf that is perfect for boot storage and a shelf on top that works great for hats. There are four hooks that are great for adult and kid-sized jackets. If you don’t have the space for a hall tree, you might want to consider an entryway organizer. This one has a small footprint but is very functional for holding coats, backpacks, and shoes. My other favorite thing in the mudroom is the console table. It is the same collection as the hall tree, so I love the wood against the medal. Plus, they match without looking overly matchy. Just like the hall tree, the console table has two extra shelves that are perfect for more storage. I use the bottom shelf for boots and I used the middle and top shelves for a combination of functional storage and accent pieces. 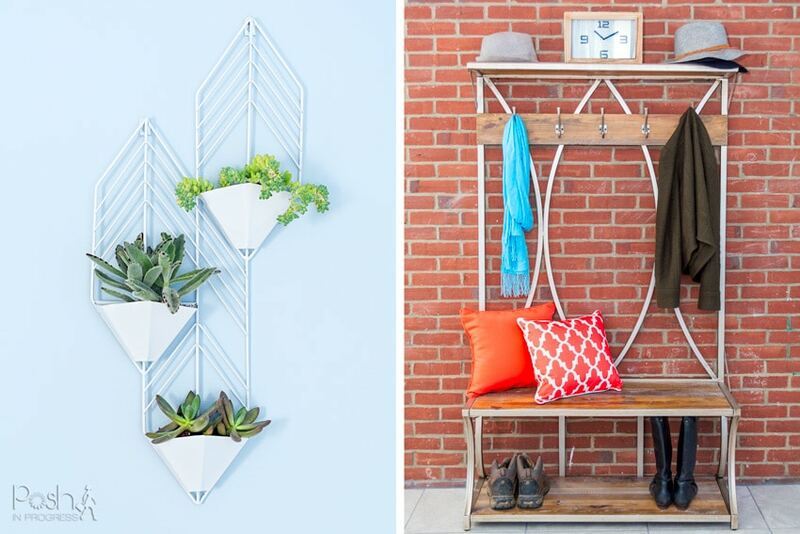 Even if you don’t have a green thumb, you can still add some natural elements to your mudroom. I chose this hanging planter and filled it with succulents (read: hard to kill!). It looks absolutely adorable and adds a nice touch of nature inside of the space. I also had room on the console table for a vase that I filled with fresh flowers. I know you might think it’s silly to have flowers in your entryway or mudroom, but I love it. Here’s the thing – in our home, this is the first room I enter. The moment I walk in the house, I see that vase of fresh flowers and I’m instantly in a good mood. It’s the little touches that make a room special, and the gorgeous teal vase with fresh flowers does bring me (and the room) joy. Rather than put up artwork, I used the walls to create message centers. This wall calendar helps keep me organized on some of the major events coming up that month. It is a wipe board and magnetic, so I can change it each month and also hold the kids’ artwork or important papers if I need to. I also hung up this chalkboard wall organizer that also has pockets where I can hold mail, bills or other papers that I don’t want to misplace. I use the chalkboard to remember important things, like upcoming events or things on my to-do list. The chalkboard is also magnetic, which is great for hanging more artwork. We also installed a little key holder that also functions to hold the chalk and markers for their respective boards. When selecting a rug and pillows, I chose to get in-door/out-door ones because I thought they would hold up better to getting wet and trampled on by my young kids. I chose these pillows in a bright color because pillows are a great way to add color without committing to a color palette forever. If I decide in a year I don’t like the coral, it is inexpensive and simple to get new pillows. As for the rug, I chose a neutral gray but matched the pattern of the pillows and the rug for a consistent design. I absolutely love this indoor/outdoor rug. The pattern is so chic, it seems super durable, and it fills the space perfectly. Since the room is square, I got a square rug, but this style comes in several different shapes to fit whatever space you have. You don’t need to go crazy with accents, but you want to add a few pieces that evoke your style and tie the room together. One of the first accent pieces I chose was this clock for two reasons – one, it’s helpful to have a clock in the space I use to get my kids’ packed-up and ready for school. Second, it matched the distressed wood in the rest of the space so well! As for the console table accessories, I found this decorative box, which is perfect for holding sunglasses, wallets, spare change, etc. It provides function and organization for the table, while also adding a touch of style. As another subtle way to bring nature inside, I also chose this tree slice sculpture and marble pyramid. Both are made out of natural materials and also go well with the industrial vibe of the space. 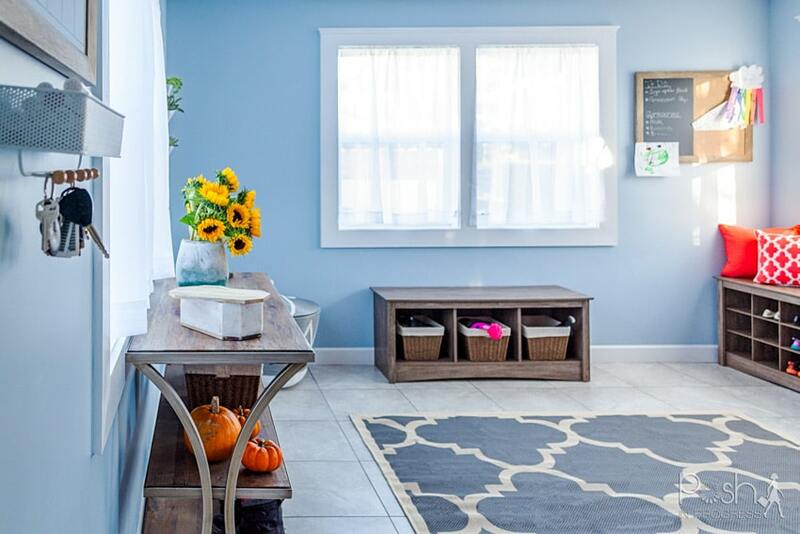 If you have windows in your mudroom, I suggest you opt for light-filtering or sheer curtains. I chose these simple white curtains because I wanted something very lightweight that would provide some privacy while still letting tons of natural light into the space. I installed them in the simplest way, using tension rods. This is a great, low-cost and low-effort way to hang curtains. If you’re renting or you want to try out different styles of curtains, tension rods are also very low-commitment. 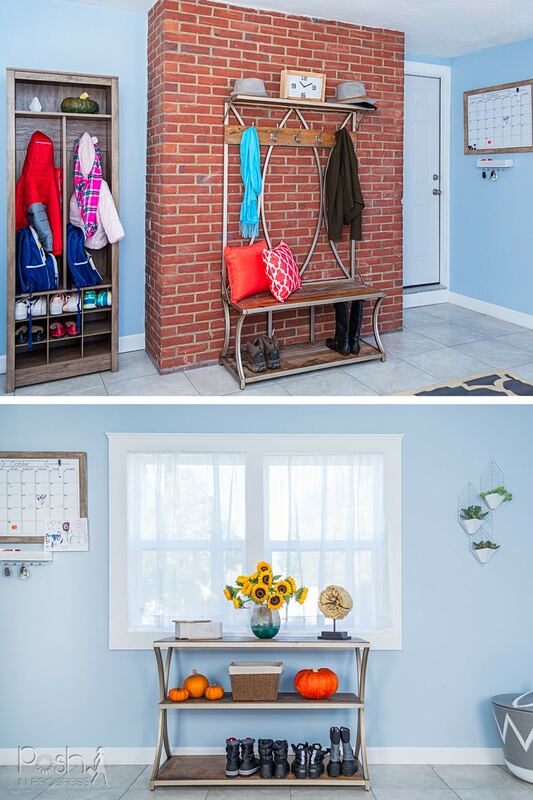 I hope you find these mudroom ideas helpful when you’re designing your entryway or mudroom. I’m so happy with how my space turned out. Since it’s the first room I walk into when I get home, it’s so nice to have a well-organized, modern and functional space (not to mention it’s so pretty!). If I can help you in your design process, definitely reach out and let me know! Happy decorating!